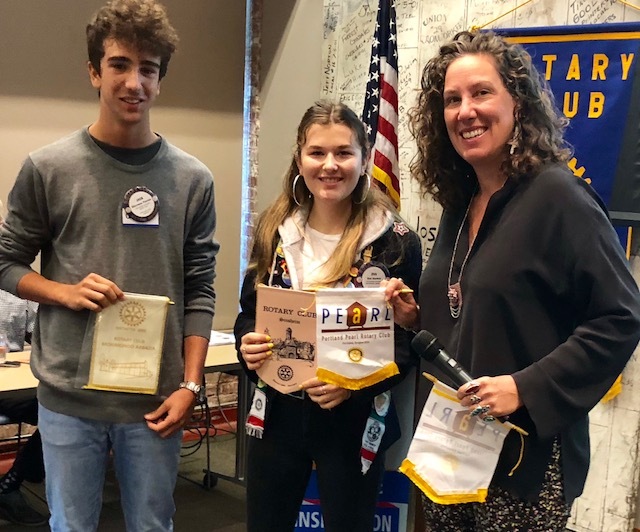 "Hosting of the German high school students Sept. 30 was amazing," summarized Paul Thompson, Pearl Rotary's president-elect. "Every time I host, it is an incredible experience. This year was no exception." 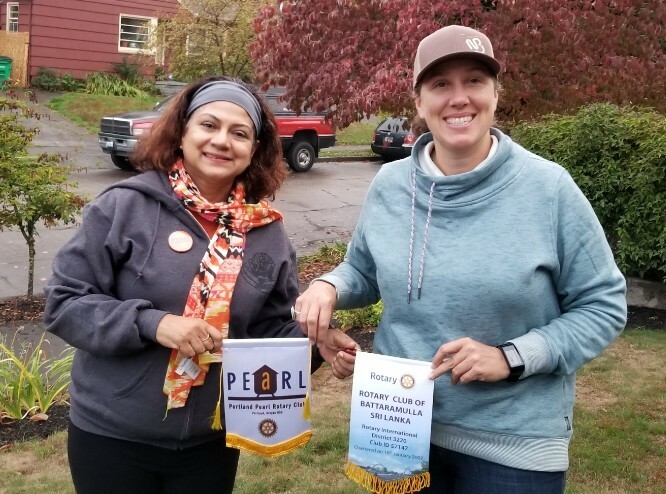 Since 2007, Pearl Rotarians and their families have opened their homes and expanded their weekend calendars for five to six hours. 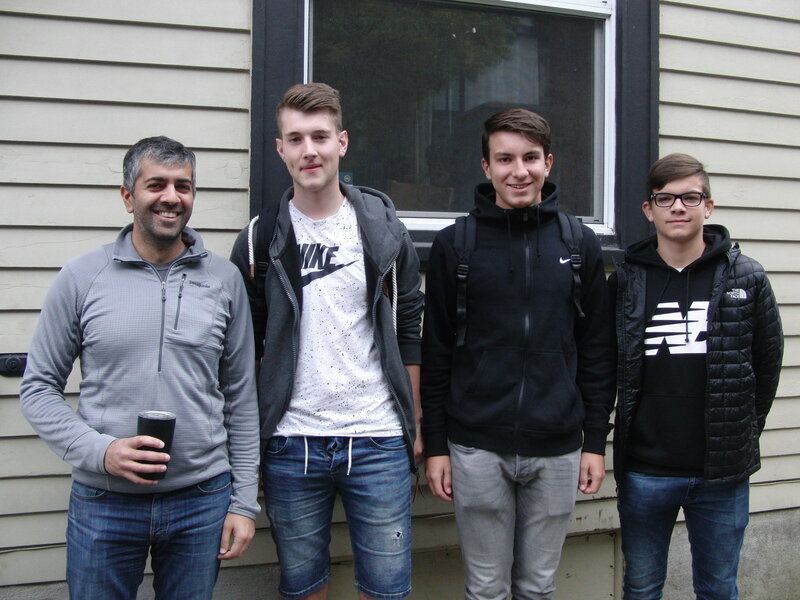 The students, based at the International Hostel in Northwest Portland, spend about two weeks in Oregon. A variety of cultural events, tourism and even volunteering fills their time. 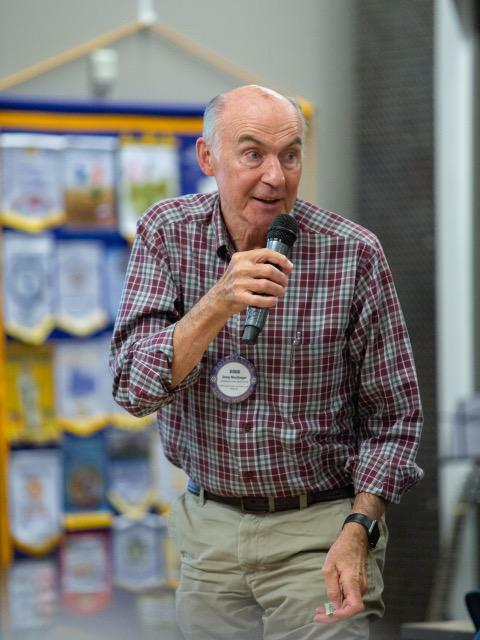 Presenters again this year included Lou Radja (above), past president of PPRC and a motivational speaker. A major highlight on the schedule is the day spent with Rotarians. 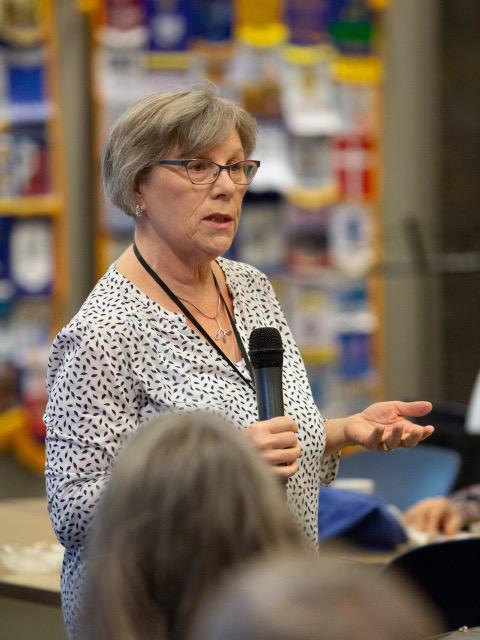 It's their one opportunity to be in homes and meet American families (while speaking English), according to Annika McClure, lead teacher at Gymnasium Stolzenau, who initially started the connection with Pearl Rotary. 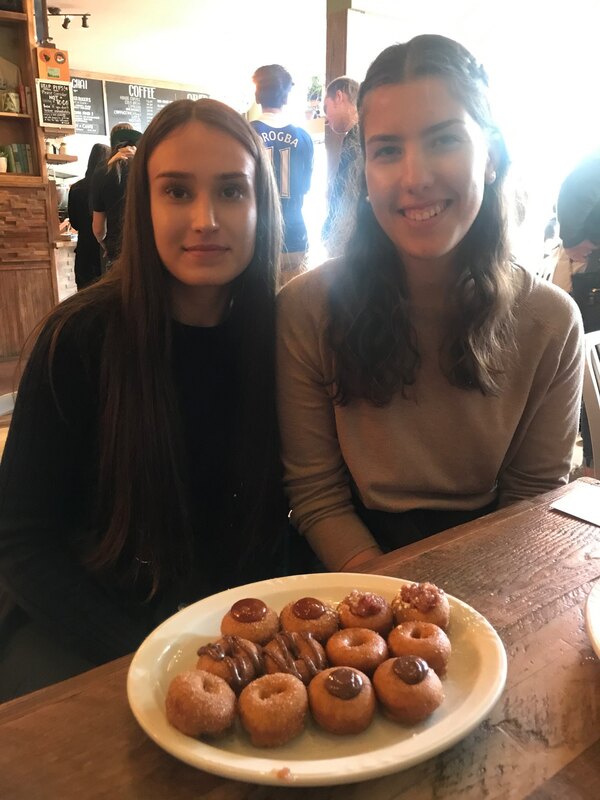 Annika, retired headmaster Peter Lampe and three of the 25 students (Clemens, Yasmin and David) attended the Oct. 2 breakfast meeting to extend their thanks (see pictures immediately below). 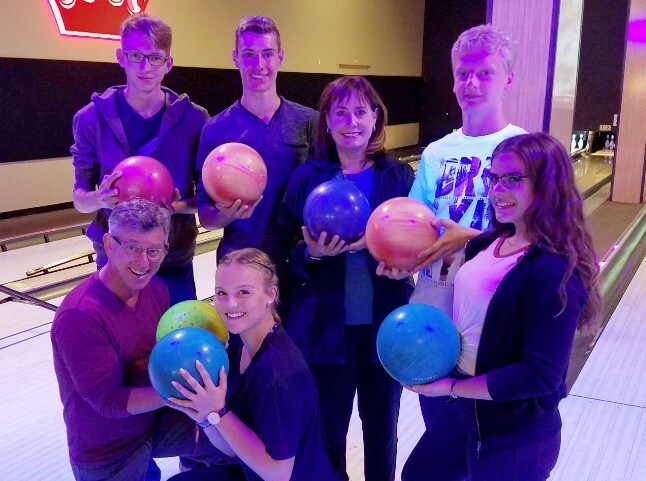 Eleven groups of students were collected by their hosts (some Rotarians combined forces for the day--evidenced in the picture above at Grand Central Bowl with Rotarians Jan Berger and Kelly Morrow and five Germans--Finja K. and Emily N.; Robin, Oliver and Tobias). 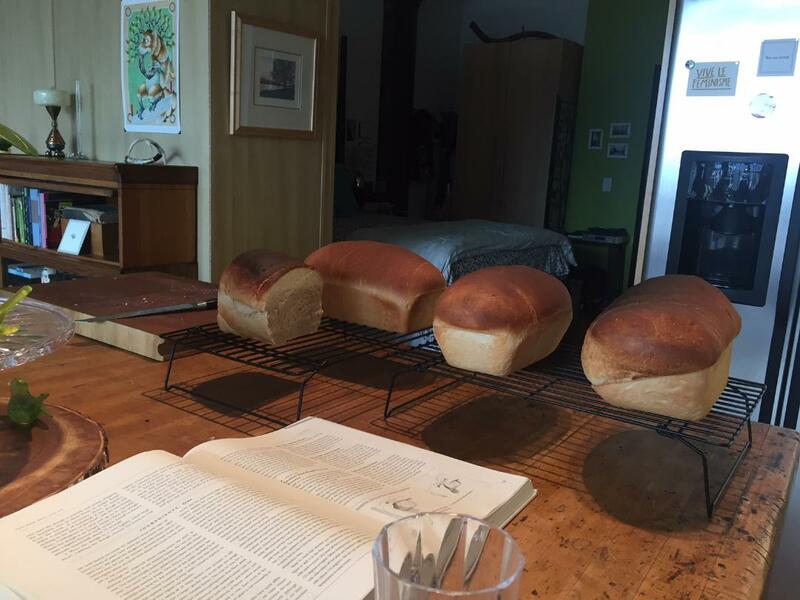 Paul Thompson: "We spent the day making and breaking bread together. The students each made their own loaf. While the bread rose, we journeyed to Blue Star to get some delicious donut nourishment. After the bread was baked and sampled, we finished the day at Ground Kontrol playing old school arcades such as Mario Kart, Star Wars, Ms. Pac Man and several pinball games. Hannes, Clemens and Tolga even taught me a German card game, Schwimmen. While the bread baked, we listened to jazz albums by Louis Armstrong, Miles Davis and Ella Fitzgerald. I had a wonderful, soulful-filled day." 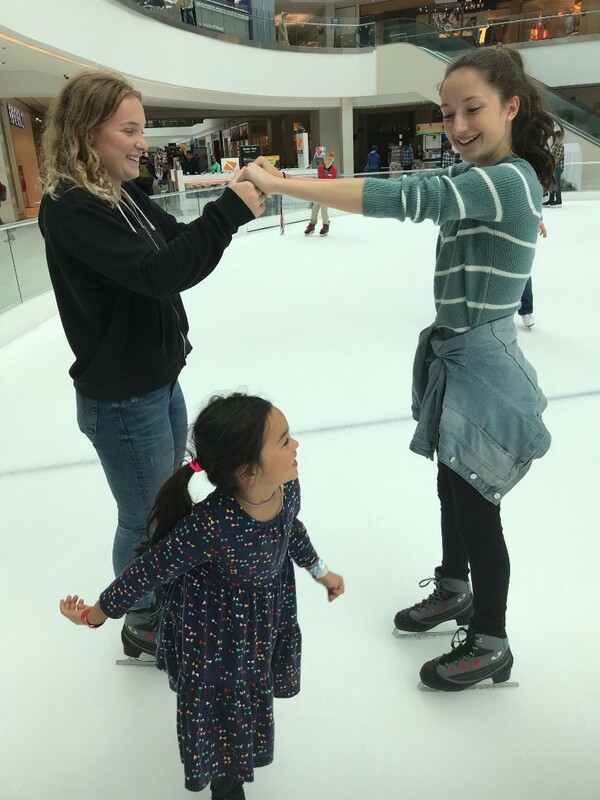 Jordan Weisman: "We went to Sauvie Island, ice skating at the Lloyd Center, and cruised around Alberta Street. Hannah and Malin were both very sweet. Reina (his daughter) and I hosted them for the day." 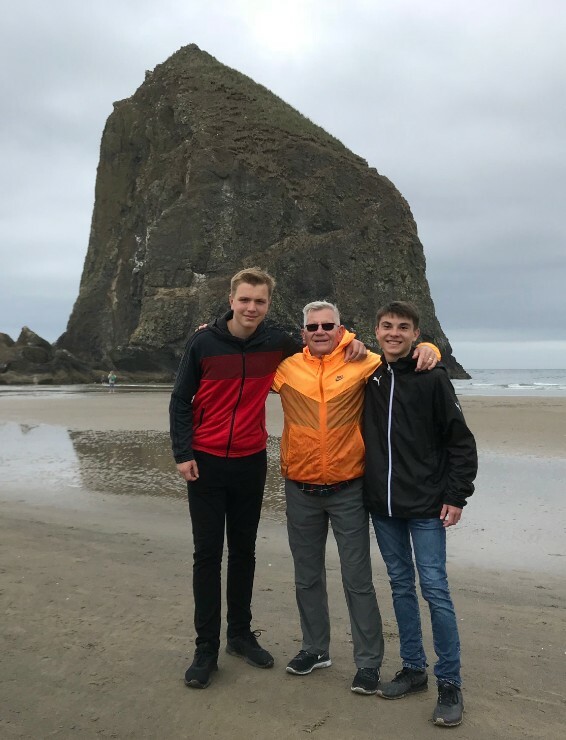 Perry Swanson: "My day with David & Malte: Had a refreshing walk on the beach (read rain & wind! 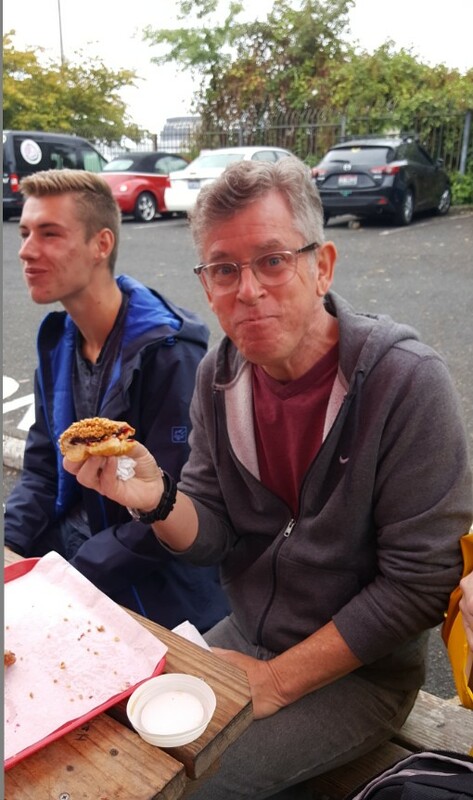 ), followed by a seafood lunch in Cannon Beach, back in Portland to my house to meet Lynn (she had granddaughter duty earlier in the day), and to look at old photos of her ancestors from Bavaria." 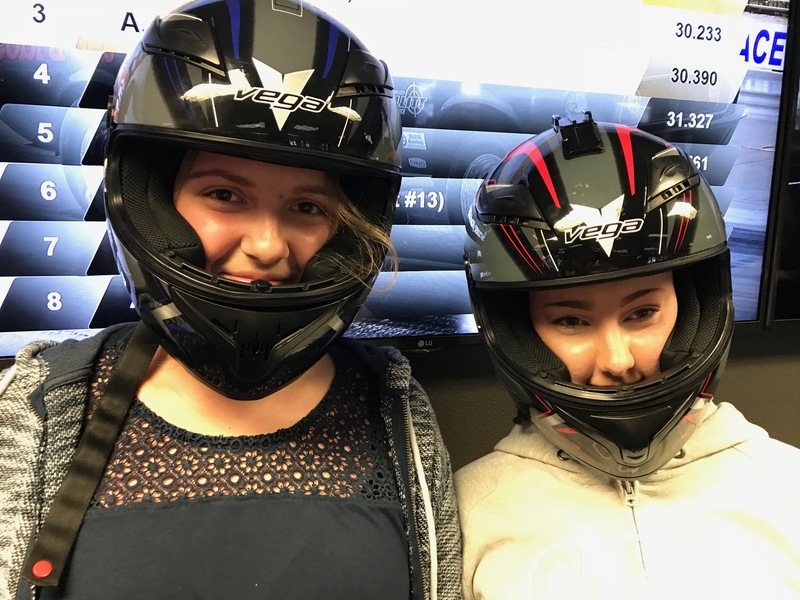 Anne Oneill: "Vanessa and Isabell, from Nienburg and Rehburg, tore up the Go Cart Raceway in Tigard Sunday (above). We also bowled three rounds at Super Play in Beaverton. Thank goodness, modern bowling scores automatically! We passed a door labeled “Laser Tag” while leaving and are curious about that for next year. Anyone? I think we will need a group of at least 10 for critical mayhem. Great Mexican lunch at El Guajillo." 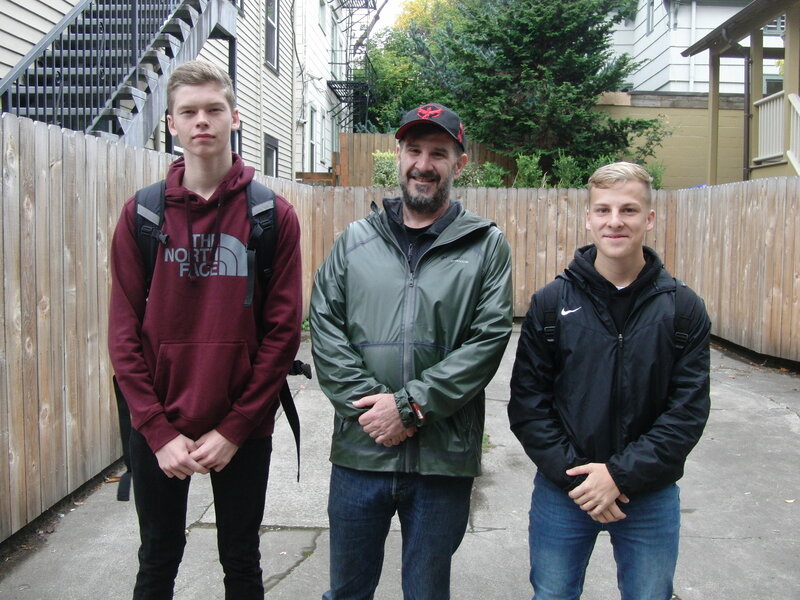 Jan Berger: "Kelly (Morrow), Joel (Godbey) and I decided to join forces and spent the day together with our five German students. Jan hosted Finja K. and Emily N., Kelly and Joel were in charge of entertaining Oliver, Robin and Tobias. 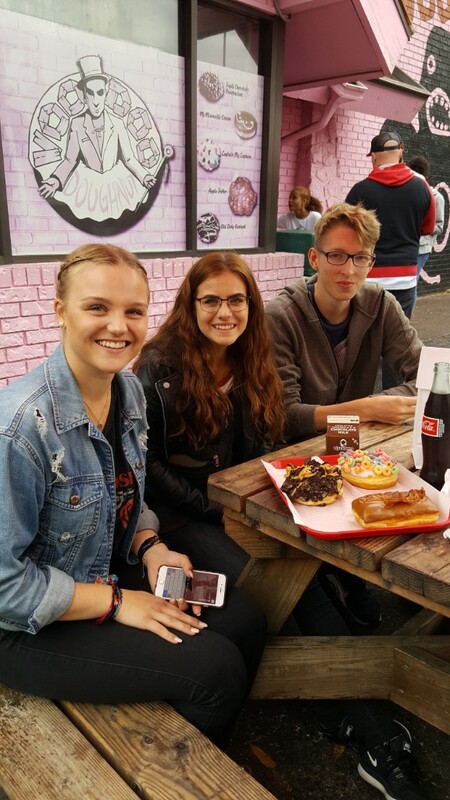 First, we headed over to Voodoo Donuts in order to have our guests experience the quintessential Portland experience. Donut choices included raised donuts with chocolate frosting and smashed Oreos, donuts with white frosting and Fruit Loops, and the proverbial maple bar with crisp bacon. Next, we tried to work off a few of the donut calories with 2-1/2 rounds of bowling at Grand Central Bowl (top photo). We added to the calorie count with loaded chicken nachos and Cokes in between bowling frames. Next, we drove out to Hillsboro for golfing at Topflight Golf and gave the students their first golf lessons. The Air Show was in full swing at the Hillsboro airport, so we were able to watch some of the fighter jets perform. We ended our day at Pieology where each student was able to order a custom pizza to their own taste. Who knew that Germans like corn on their pizza?!" 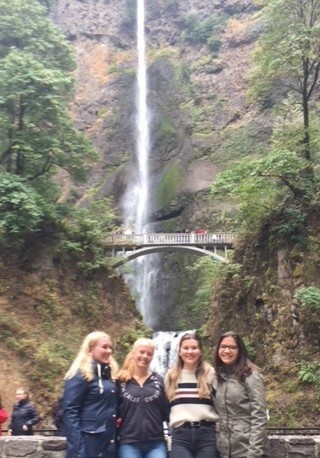 Dave Price: "Picture, from left to right--Eva, our inbound exchange student from Germany (Dave and Margo are first host parents); Pauline, an inbound German exchange student with Rotary in Oregon City; and our two German high school students--Yasmin and Finja R. We went to Multnomah Falls and then up the Gorge to apple country outside of Hood River, where we stopped at a farm that had a pumpkin patch and corn maze. We then proceeded to Mount Hood and had lunch at the Huckleberry Inn. After that, we went up to Timberline Lodge and then back to our home in Portland. 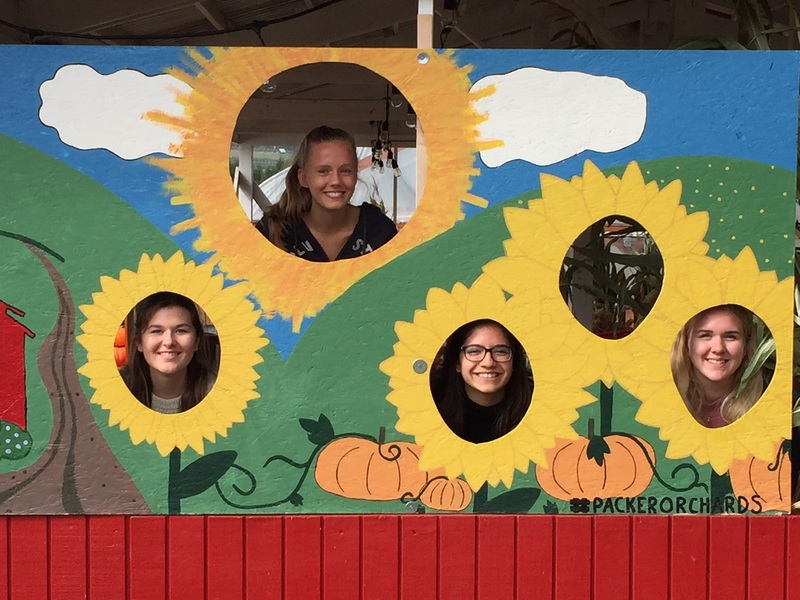 The girls had a wonderful time and both the exchange students and visiting high school students did a lot of chatting (in English, of course) about their experiences so far in the U.S. and specifically about the Rotary exchange program." 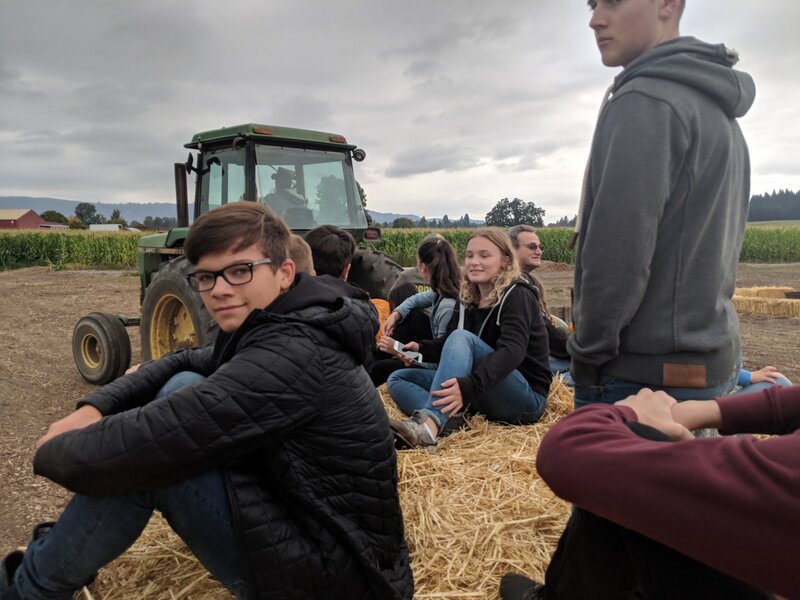 Roger Devine: "Bjarne, Jules and I spent the day with Farhad (Ghafarzade) and the three students he was shepherding (Justin, Luca and Finn); we went to Sauvie Island and did the corn maze, a hayride (pictured: and ate grilled corn and hot dogs. Then we went to Ground Kontrol and played video games, then walked through NW Portland for a while, just talking." 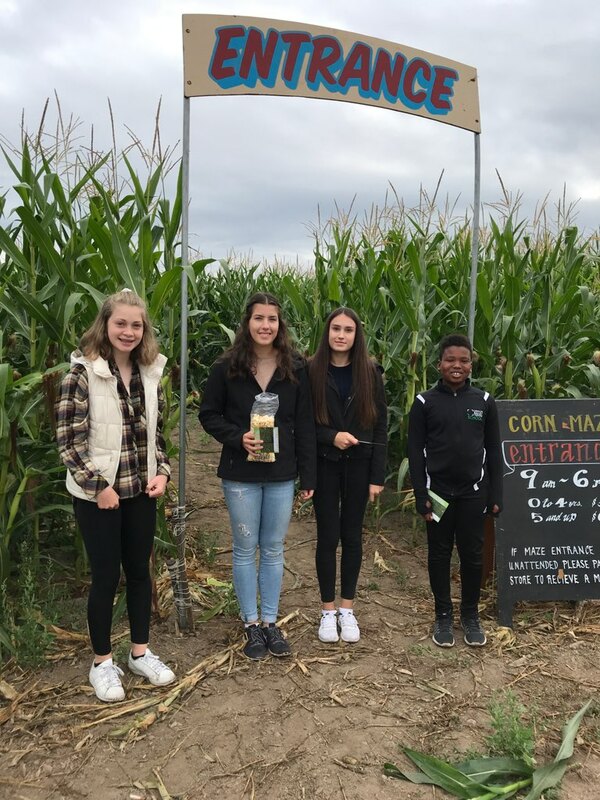 Andrea O'Donnell and family (husband Randy, Mira and Xavier) hosted Sara and Dajana (Andrea is the daughter of Rotarian Don and Nancy Smith): Their day included Sauvie Island, a Mexican restaurant, a visit to their home in Northeast Portland and treats at Pip's Donuts on Fremont. 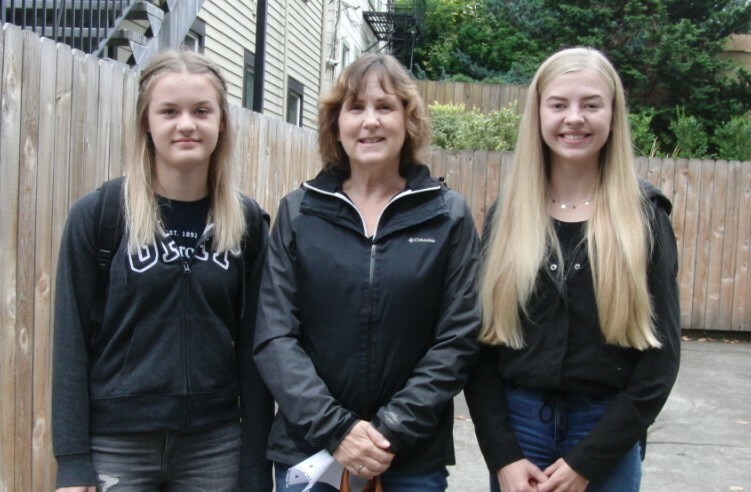 Dawn Schneider, like her fellow Rotarians from the Pearl club, met her German pair, Dorothee and Emely B., at the International hotel in NW Portland. "Thank you so much for hosting us, Adina Flynn! We had a great day! All members of the Pearl Rotary Club are a blessing, that they help us giving our students an unforgettable experience. Thank you for being there for us each year, Paul Thompson and Donald Q. Smith!" Adina responded: "My pleasure! Always nice to take a day and share my lovely region with others. I always learn a lot and I am enriched by these experiences! Thanks, Donald Smith, for being on vacation and letting me step in in your absence." And Annika had this summary as the day and evening ended: "It was a great experience again. Many kids went to Sauvie Island, Multnomah Falls, Cannon Beach. I don't know about the Rotarians, but the kids loved it. Many, many stories lasted into the evening. 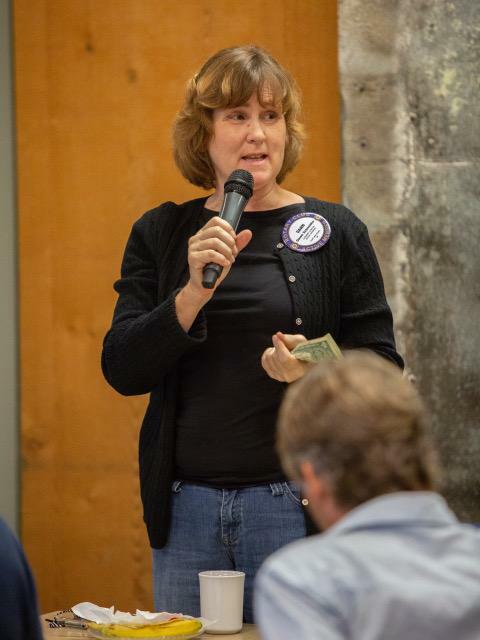 For me, it was wonderful to see so many familiar faces from Pearl Rotary." Find your place in Rotary. I, of course, love the service aspect of Rotary. 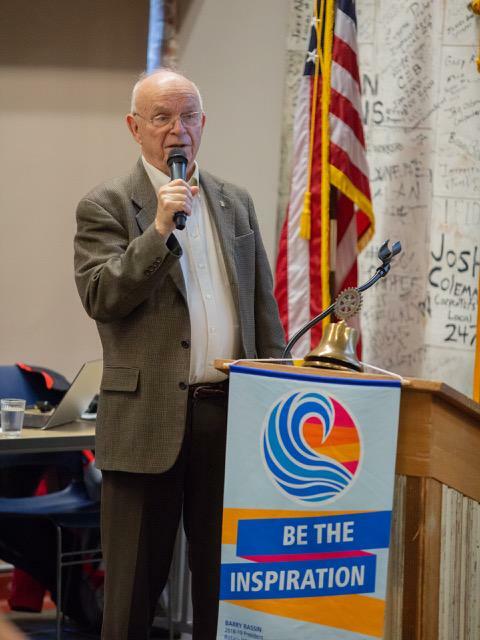 Without "Service above Self," Rotary's motto, it wouldn't be Rotary. 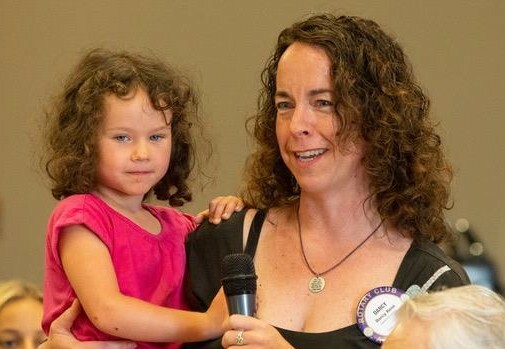 But the other aspect of Rotary that I love are the international connections. Over my 11 years in Rotary, I have made friends in India, Germany, Croatia and most recently, Sri Lanka. The benefits of these relationships span from pure pleasure to world peace. These connections help us build better international service projects and understand other cultures. 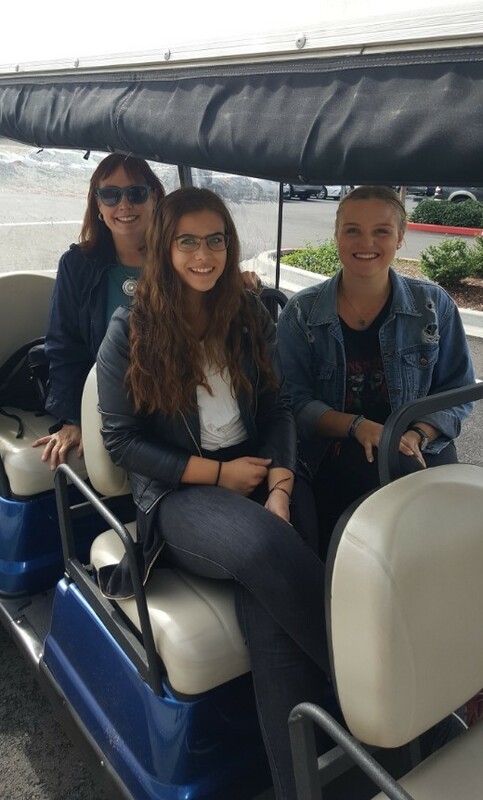 In September our Pearl club hosted a class of high school-aged students from Germany. I had the honor of taking the teachers out for a day off from their students. 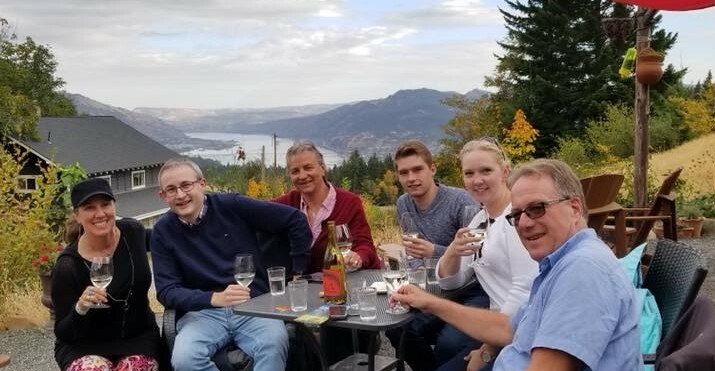 We drove up to Mount Hood and had lunch at Timberline Lodge and then over the mountain to do some wine tasting in the Columbia River Gorge. Along the way, we had conversations about the differences in our cultures including our educational systems. I was fascinated to learn that in the public school system, they teach religious classes. Last week I connected with a Rotarian from Sri Lanka, Tania Weerasooria (Battaramulla RC), who was unable to attend our weekly meeting. 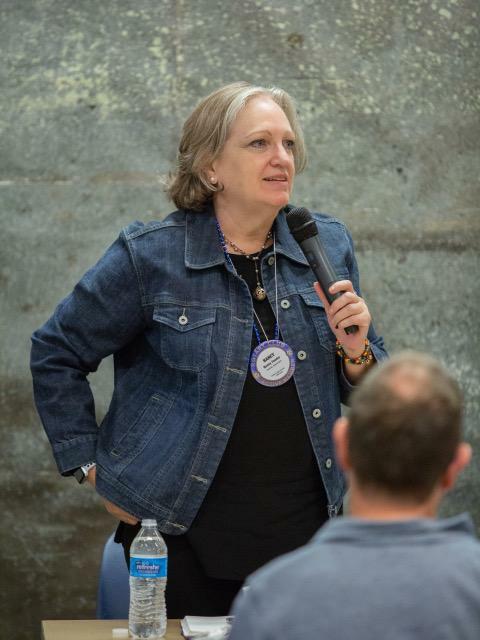 As it turns out, she is president of her Rotary Club this year and she is also a Lewis and Clark alumni. I graduated from the law school! While our meeting was brief, we were able to connect up later in the week for a banner exchange. Rotarians love our banner exchanges. And they can happen anywhere! I believe in the value of these connections to further the work we do with international service and Global Peace. But wherever your passion is, you can find a place in Rotary. We have youth programs, vocational programs, local community service and the list goes on. No matter what, there's a place for you in Rotary! 1. How long have you been a Rotarian? What or who introduced you to Rotary? Fall of 2017 is when I joined. Joan Pendergast and Tracy Vicario had invited me many times over the course of a decade. 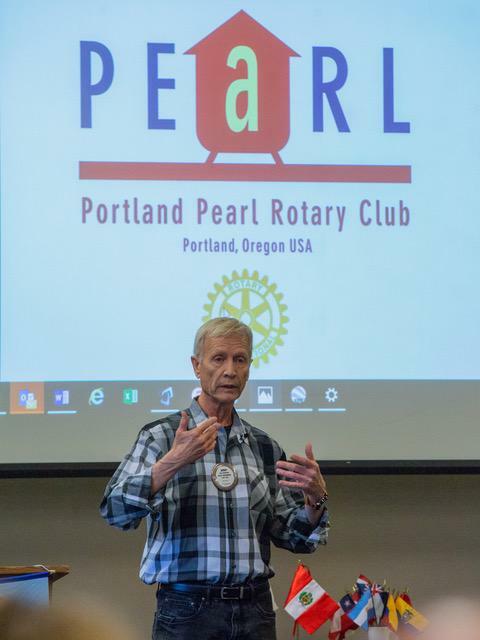 I always knew that I wanted to join Pearl Rotary. When I finished up a few projects with the Pearl District Neighborhood Association, I finally had time. 2. A short paragraph about your family, work and hobbies. I am married to an amazing woman named Brynne. She and I met in 1997, started dating shortly after and were married in 2001. We built a couple of homes and purchased 17 homes in the first nine years, and nine months we were married. After we got that out of our system, I switched to residential lending full-time to help people avoid the mistakes I made and to facilitate informed decisions surrounding mortgages. n 2010 we had our first child, Claude Frances. Twenty-one months later, Knox was born. They both attend Chapman Elementary and love Portland Judo. Brynne teaches Total Body Conditioning at the Pearl 24 Hour Fitness. I attend her class when I want to be humbled. 3. What can you tell that might be a surprise to many of us? At a morning meeting early this year, I shared my life story that I put together for my kids as part of the Estate Planning Process. I shared all I wanted to share and then some. The only thing that was not noted was that I race bikes. This summer after racing the Oregon Criterium State Championships, my kids asked me, "How did you do dad?" I told them, "I got third place!" Their response, "Oh, so you lost again." On another note, I am working with a race promoter to bring the Oregon State Criterium Championship to the Pearl District next summer and keep the North Park Blocks activated. 1. How long have you been a Rotarian? What or who introduced you to Rotary? 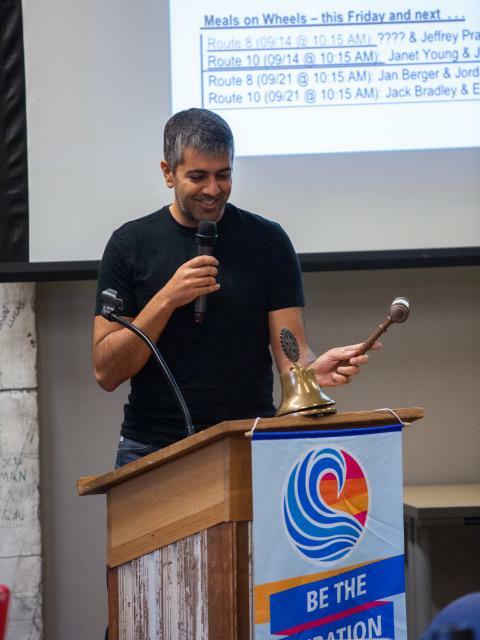 It's been nearly seven years since I became a Rotarian, but it feels like much longer. I was first introduced to Rotary when Miel [twin sister] went on youth exchange to Finland, and I then I studied abroad in Denmark. 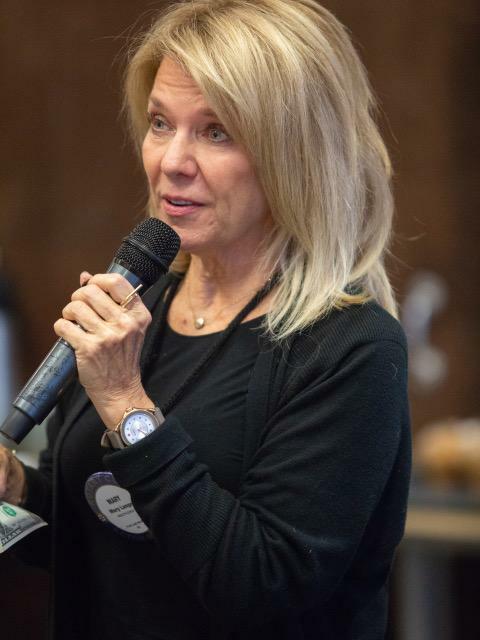 Feeling inspired by Rotary International's humanitarian mission, I knew I wanted to become a Rotarian once I was "grown up." Now, my kids inspire me to be active as possible, wanting to make the world a better place for future generations. 2. A short paragraph about your family, work and hobbies. My life is focused on my kids, with Kieran in 7th grade, Makenna in 4th and Teagan in Kindergarten. The majority of the miles I put on my minivan are taking them to soccer, football, wrestling, baseball, aerials… As a newly single mom, I am still redefining my life and work. I co-own Olivia Beach Camp Cabins, with my twin Miel. I am starting to write again for my blog, Darcy’s Utopia, where I share my spiritual journey and hope to inspire personal transformation, collective awakening and social justice. I practice kundalini yoga and meditation nearly every morning, along with reading tarot. I also love biking and any chance to get in or on water. I’m also excited to transform my new corner yard from weedy grass lot to a flower and vegetable garden. 3. What can you tell that might be a surprise to many of us? In high school, growing up on the South Umpqua in Southern Oregon, I was the president of my school’s FFA chapter. I started a nursery program and won prizes at the county fair for my tomatoes and marigolds. Meanwhile, I wore tie dies nearly every day, and volunteered on the teen crew at the Oregon Country Fair. 1. Palm Institute of Strategic Leadership in Ghana. Former Pearl Rotarian Peter Okantey has built a university in Ghana through the NAPE foundation which he chairs. The university is in need of reliable and clean power (solar plus storage), connection to the city water line, school furniture, street lighting, and a computer lab. 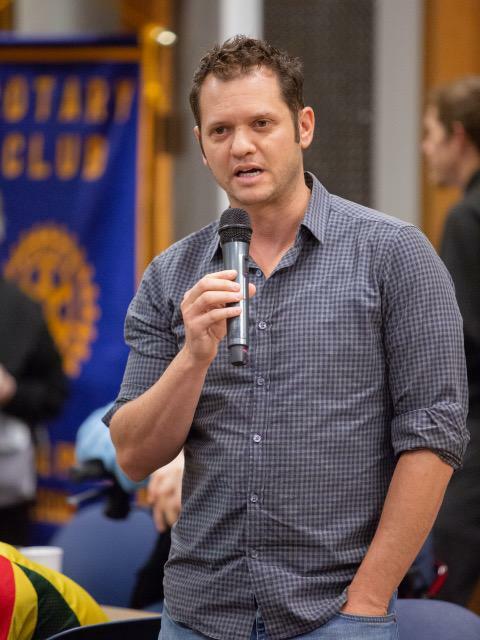 Peter has already joined a local Rotary Club in Ghana which is excited about teaming up with us for a Global Grant. 2. New Roots Farm in Haiti. This farm operates as a non-profit in rural Haiti. The local community surrounding the farm has minimal opportunities for job and economic growth. The goal of the farm is not only to produce sustainably raised poultry and hogs but to create and provide well-paying jobs in the local community. Currently, they have a staff of 12 people and have recently invested in a large butcher shop building with plans to grow production and add many more employees in the coming years. The problem is the farm has no access to grid power and must rely on solar and battery storage in order to power their refrigeration and butchering equipment. This project would fall under a global grant for economic development. Sunbridge Solar is also willing to support this project by donating time and resources to help in the installation. 3. Green Empowerment Nicaragua Water and Sanitation Project (WASH )--seeking $35,000 from the Rotary International to provide 150 families (675 people) in the community of Wisisi, Northern Nicaragua ,with access to improved sanitation for the first time. Families in Wisisi, like all communities in which we work, lack the financial resources needed to implement this kind of project on its own, but are committed to supporting the installation, use and maintenance of the new latrines. To engage their participation in the project and help ensure their sense of ownership over the new facilities, families will provide local materials, a bag of cement per household, and necessary unskilled labor (pit excavation and a helper to the mason). Our partner would be the Rotary Club of Isabela City, Basilan. 4. Green Empowerment Philippines Water and Sanitation Project (WASH) . In order to bring potable water and access to sanitation to all six communities in the Leyte region of the Philippines, Green Empowerment is seeking $455,000 in support–an average of $75,500 per community and just $70 per project beneficiary. The budget needs are based on the actual expenses of past projects and individual sites vary from $60,000 to $90,000. The major driver of the cost differences between communities is population size which determines how many connection points are needed and the location and type of the water source. 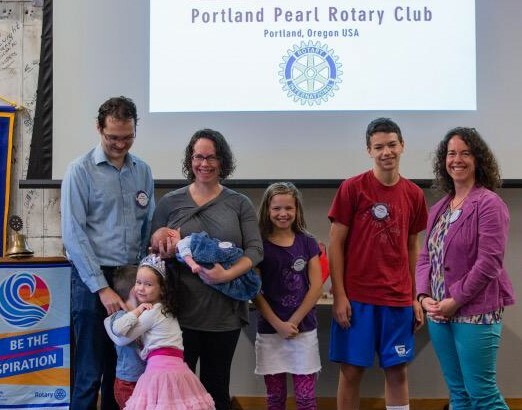 Green Empowerment is interested in working with the local Rotary Club in Ormoc City and a club in Portland, OR to advance projects for 1-3 communities. 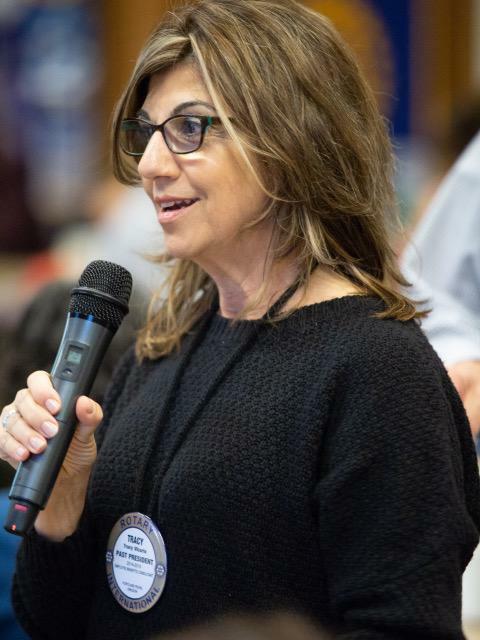 In addition to taking the lead on a global grant, the committee is working to develop distinct job roles within the committee to make it more interactive and productive for Rotarians who wish to be involved. There is a goal of also developing partnerships with both Lincoln H.S. and Rotaract in order to work on projects and fundraise jointly. It is my belief that the Pearl club has the ability and potential to be a leader in our district for international projects. It's going to take a lot of hard work and organization, but we are well on our way. 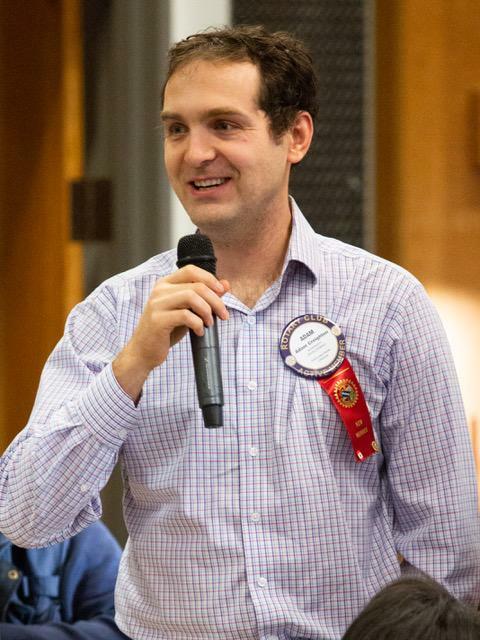 We can still use help so anyone who wishes to join reach out to Jordan Weisman (jordan@sunbridgesolar.com). • Wednesday at 5:01 p.m. is a social gathering of members and their guests which helps us get to know each other better. So far this fiscal year, we’ve had First Wednesday at The Deck on NW 14th and Kearney; the Hairy Lobster adjacent to Jameson Park; and Eleni’s Philoxenia at 9th and Couch (see image above). Thanks to Mary Lange and Joan Pendergast for their regular behind-the-scenes work to make sure this event keeps happening. A reminder: First Wednesday works best if you have cash to pay for yourself and any guests. With large crowds, splitting the bill for individuals is cumbersome and time-consuming for the restaurant. • Giacomo’s Soccer Game. One of our exchange students, Jack from Italy, is playing on the Wilson High School soccer team. They are playing Lincoln High at the Lincoln Field on Friday, Oct. 12, 7 p.m. 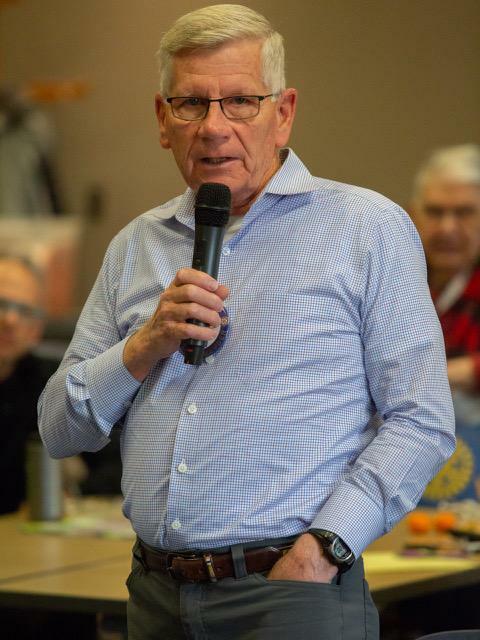 Since this was a couple days away from press time for this newsletter, there are no pictures to share, but the Wilson team will have some Rotary supporters on hand to cheer them on! • Rotary Cares. Just a reminder that the Club Service committee can mail cards to members who have had significant life issues happening--but only if we know about it. Please let any of the Club Service Committee members know if you become aware of someone who might appreciate a card from us. Those members are: Janet Young, Mary Lange, Diane Brandsma, Joan Pendergast and (almost new member) Clint Colbert. • Watching the Swifts. 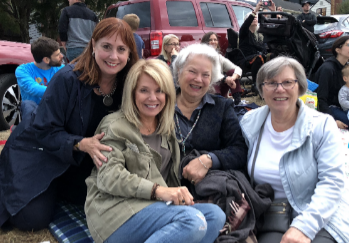 Several Club members, and some of their guests, turned out on Friday, Sept. 14, to watch the wonderful spectacle of the Vaux’s swifts spiraling into their chimney roost at Chapman Elementary School. This natural wonder never fails to amaze. 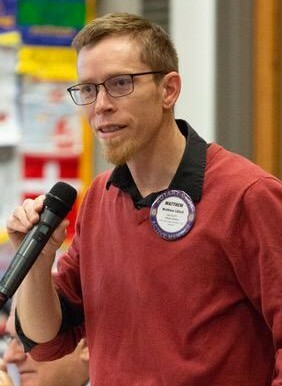 • PPRC will support Growing Gardens' "Dawn of The Bed" on Saturday, Oct. 27, with PPRC's "Rake Superior" team of eight Rotarians, led by Team Captain Michael Steen. This is the annual autumn event where teams of volunteers create vegetable garden planting beds for low-income families in the Portland metro area. This has proven to not only be a rewarding community service experience, but also a great fellowship opportunity for Rotarians. Our team is now working in the fundraising phase as they prepare for the event. • Next bingo and ice cream evening at White Shield is Thursday, Oct. 25. 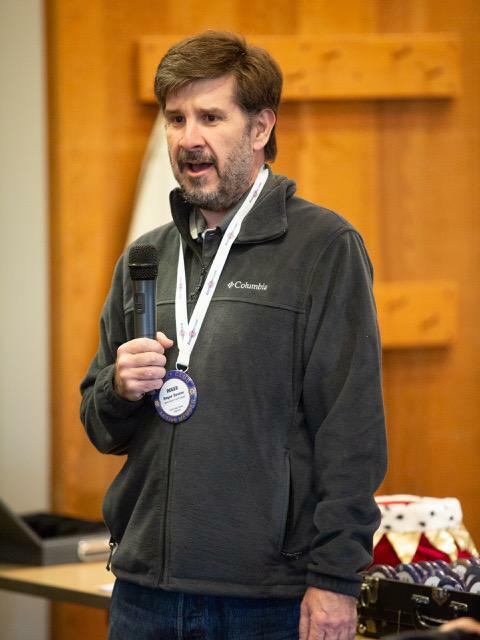 • Clint Colbert, a past Rotarian from the SW Portland club, is a software consultant. • Jim Miller is a financial advisor at Edward Jones in NW Portland. We look forward to their inductions before the end of October. • The Pearl Party: Sept. 21 at PDNA's annual Pearl Party, PPRC was represented by our membership co-chairs Perry & Elizabeth, and assisted by Dave Bangsund and Seth Gardner. A few party-goers stopped by our table, including several Pearl Rotarians, and we handed out a few tri-fold brochures along with invitations to be our guest at a Tuesday club meeting. 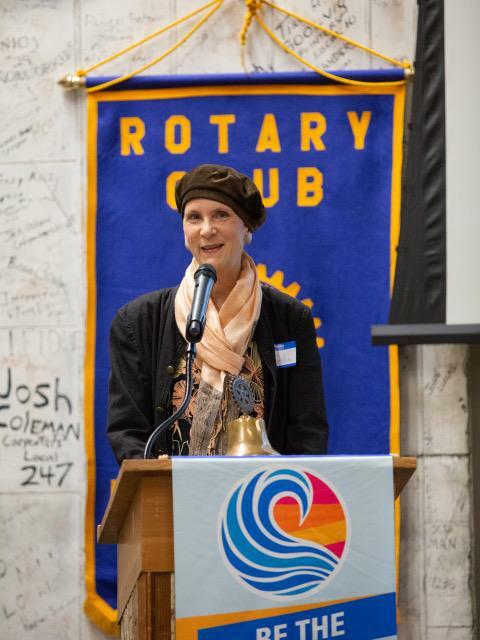 One visitor in particular we hope to see again is Julie Gustafson, the new executive director of the Pearl District Business Association. • Perry and Elizabeth met for lunch recently with Jack Bradley and Lou Radja of the Social Justice Committee to kick off a collaboration to jointly develop strategies to recruit new members of color. • Sara Shah has volunteered to join the Membership committee. Welcome, Sara! 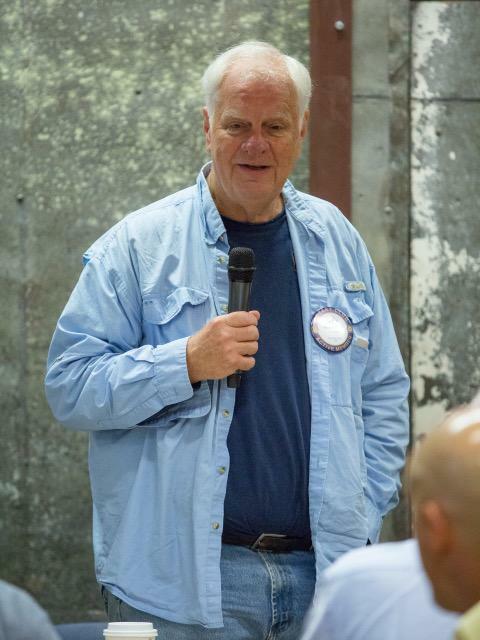 • Rotarian Karl Kolbeck resigned last month due to business conflicts with our breakfast meeting time. We thank him for his service, especially handling our student of the month program with Lincoln H.S. • At press time this week, we learned that Erick Widman is resigning (citing morning conflicts with children), but indicated he plans to join the downtown club. 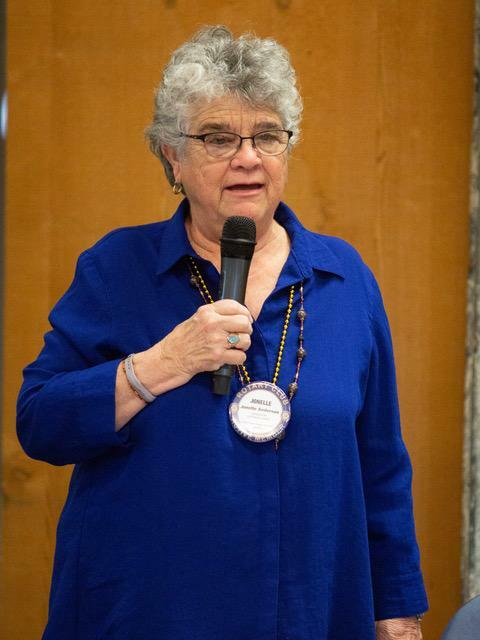 • Also no longer a Pearl Rotarian is Gwynne McCay who had served on the Social Justice Task Force. Based upon the club's desire to increase the diversity of our membership, your Social Justice Committee in close collaboration with the Membership Committee has developed a DRAFT Diversity, Equity and Inclusion Recruitment and Retention Plan, (click to download ), which will be implemented after input and modification by the board of directors at their Oct. 18 meeting. At our meeting in early October, committee members participated in a training focused on building awareness and identifying ways that people communicate in inadvertent offensive ways to people of color. The committee has decided to offer this training to all club members in a seminar format at some point in the future. The September Book Club discussion of Middlesex authored by Jeffrey Eugenides was well attended. The Committee is exploring the feasibility of having a social justice lending library available at club meetings in the future. When : Monday, Dec. 10 5:30 p.m.-7 p.m.
Summary : The urban champion Jane Jacobs had a special relationship with the City of Portland over its evolution as a more diverse, mixed, walkable place. A frequent advisor to grass-roots activists in the city, Jacobs championed lively, diverse neighborhoods, and she championed citizen activism against powerful special interests, especially in her hometown of New York. Come see this remarkable film on her life’s work, followed by a panel discussion on Portland’s current situation, and the still-urgent need for citizen activism. What does Jacobs say to Portlanders, at a time when our fabled neighborhood association system is being deconstructed? Summary : Shaka Senghor will share his personal story of transformation and second chances. Presented in partnership with “Ending the New Jim Crow”—A Social Justice Action Group of First Unitarian Church, the event will include a talk by Mr. Senghor, followed by a reception with his book, “Writing My Wrongs: Life, Death and Redemption in an American Prison” available for sale and signing. 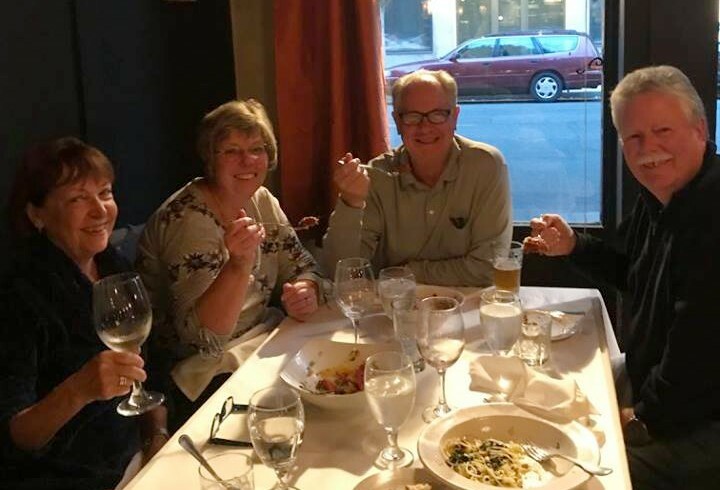 PPRC's Social Justice Committee supported Street Roots at its vendor recognition dinner Oct. 4 at the convention center; our delegation included (from left): Chris Krenk, committee chair; Jonelle Anderson, inbound exchange students Jack and Eva; Dave Price and Sara Shah. • You are reading a six-week edition of the electronic newsletter. 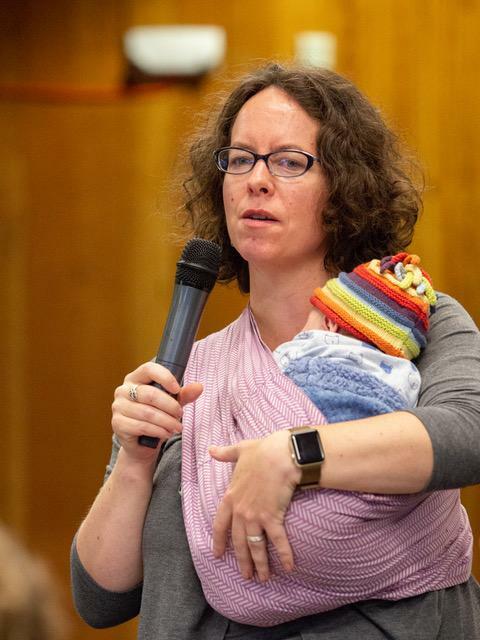 A similar publication plan is tentatively in place for late November--with coverage of the last three meetings in October and three of the four sessions next month. Watch for copy deadline sometime just before Thanksgiving. • PPRC got major "play" in the most recent edition of the District 5100 newsletter, distributed online to Rotarians. 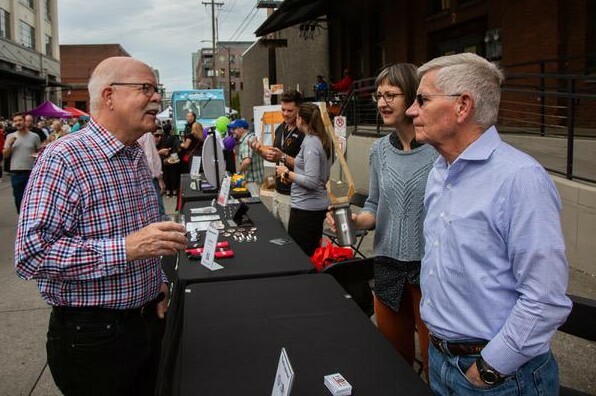 Our community service committee's Street Roots' vendor party drew the attention of DG Larry Hatch. 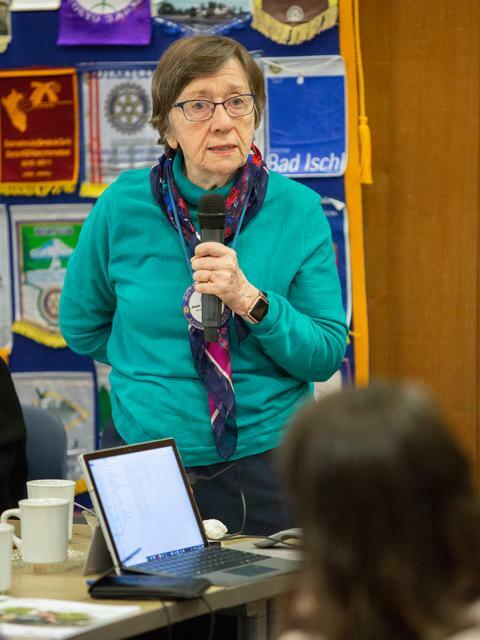 • The club assembly planned by President Adina Flynn will include a milestone for the communications committee: Rotarian Sid Smith will unveil the new PPRC website at the breakfast meeting. 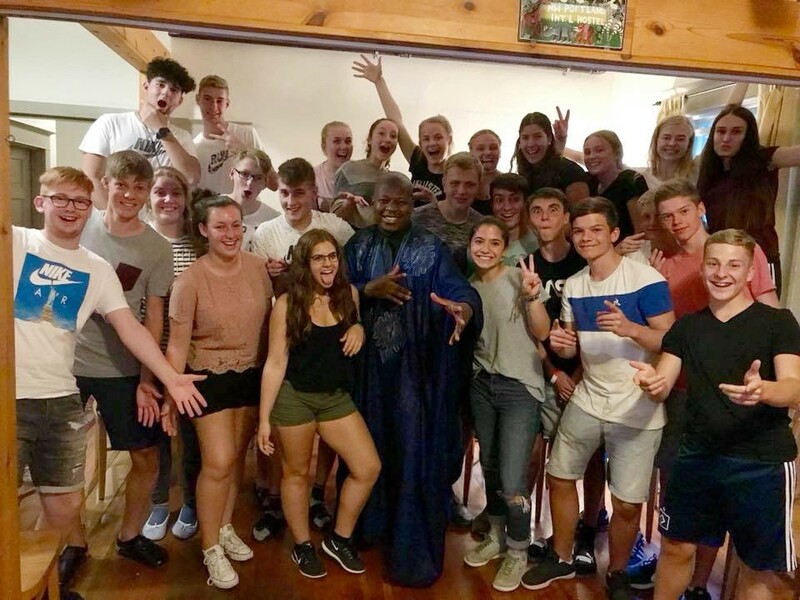 And finally a personal note from Don S.: Both my current club, Pearl Rotary in Portland, and my former club in Minnesota (Monticello), have youth exchange outbounds in the Czech Republic/Slovakia. Discovering the connection a few months back, I shared their emails and linked them before their actual y.e. year began in Europe. 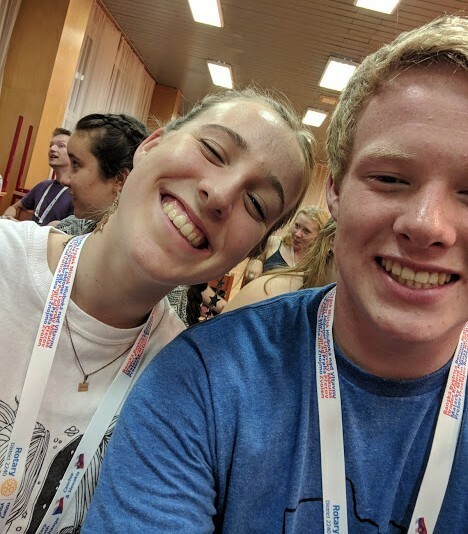 Tyler Sampson (MN) and our Jules Smith recently met in person for the first time at their district-wide y.e. gathering (picture attached). 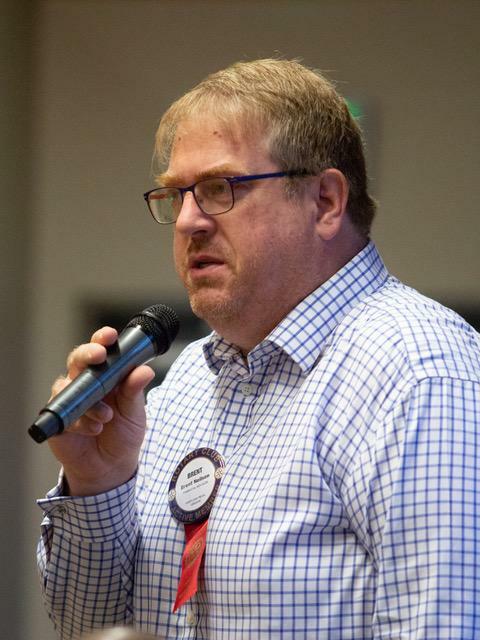 • In Pearl Rotary's "Rotary Minute" Sept. 4, members heard about the breadth of Rotary Fellowships (think affinity groups, interests, etc)...and specifically the proposed LBGT Fellowship (technically, LGBT RAF ROTARY FELLOWSHIP--RAF stand for Rotarians and Friends). 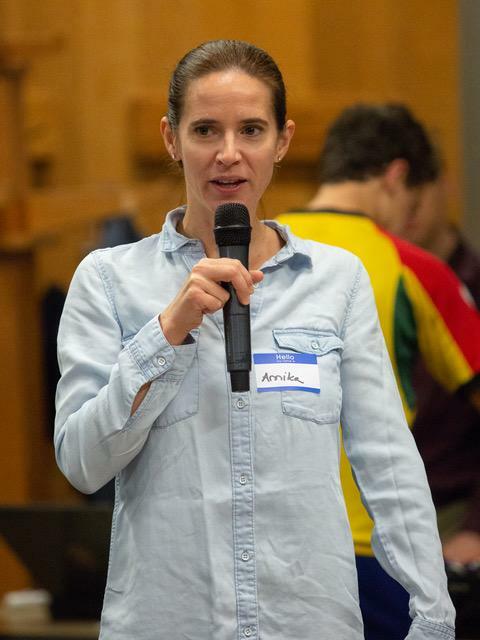 Born at the Atlanta convention in 2017, the new fellowship was formalized a year later (June 2018) at the international event in Toronto. 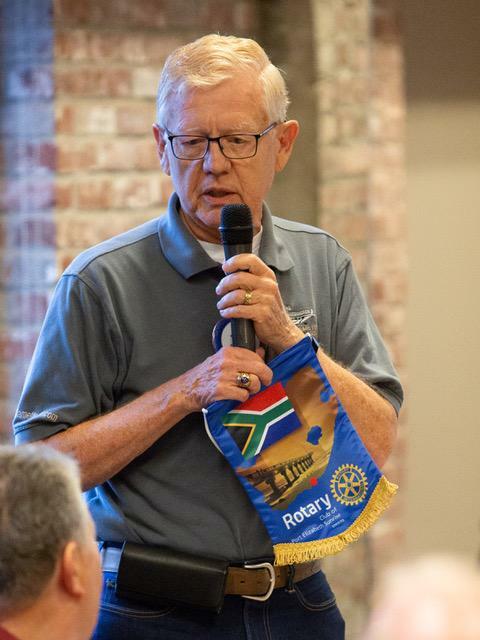 Rotarian Jack Bradley shared PPRC's important role. 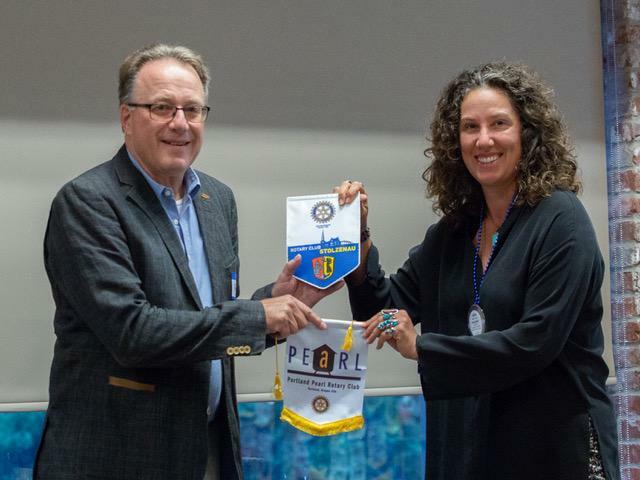 On a recommendation by the then Social Justice Task Force, which was later approved by the club board, Pearl Rotary was the tenth club in Rotary International to formally support its creation. Family: Mother, father, sister, grandmother, aunt, uncle, cousins and godparents. Involvement in the community outside school (church, volunteer organizations, youth, music, sports, etc. ): Amplify Director at Oregon Student Voice (I run the policy shop and advocacy arm of a student-run non-profit dedicated to bringing student voice to education policy decisions, oregonstudentvoice.org/amplify). Plans for the future...education, career: I’m really curious about how the world works, both from a human perspective and from a natural sciences perspective. I hope to attend college to continue satiating that curiosity and to meet people who are smarter than I am and who love learning as much as I do. 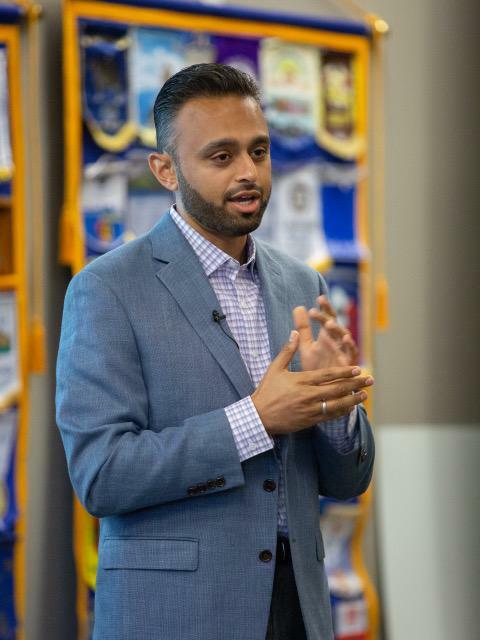 As far as a career, I’m not sure but I do legitimately see Rotary in my future, because I see myself doing good in the community in whatever profession I choose. Who inspires you? I’m inspired by lots of people (first and foremost, by my family). One man that particularly inspired me was Sam Blackman, a local tech entrepreneur, who invited me and a colleague to a fundraiser for the school bond (I was running a political action committee--Students Helping Organize Votes to Enhance Learning Spaces, or SHOVELS – and in full-tilt campaign mode at the time). He deliberately chose to invite SHOVELS to an event where members of Congress were the only other speakers. He created an opportunity where students could speak on equal footing with powerful adults. He was kind and gracious and treated me like I belonged. I don’t know if this busy man gave me another thought before he unexpectedly passed away, but I certainly think of him. One day, I hope to pay that opportunity forward to the next generation. Who's your biggest role model? My biggest role models are my parents. Aside from them, my principal at Lincoln (Peyton Chapman), who is a thoughtful, intelligent, dedicated individual animated by a purpose greater than herself. I aspire to be like my parents and like her one day. What drives you to succeed? I feel a sense of duty to my family, community and country. As the proud grandson of two sets of immigrants (my dad’s parents fled Cuba after the communist revolution to the port of Newark, where my grandfather worked as a longshoreman; and my grandmother worked as a seamstress; my mom’s father elevated himself from poverty in India through education in America and eventually married my mom’s mom, who finished high school in a language she had no prior experience with). I come from a legacy of hard work, valuing family and doing right by others. Succeeding here is a privilege, and I deeply appreciate the opportunities afforded to me that my ancestors could only dream of. I am sure that I have the potential to do something important for the world, and I refuse to throw that potential away. I’m a problem-solver by nature, and I’m excited about tackling the biggest ones we face. What would be one area of our community you would like to see improvement? I think that we should do better on education as a society. I have been incredibly fortunate to have the best educational experience I could hope for throughout my life, but I know that not everyone has had the same opportunity. Improving infrastructure, increasing teacher pay, minimizing standardized testing, supporting kids with learning differences. There are so many ways that we can and must do better. Education seeks to create socially mobile, democratically competent, self-actualized individuals, and you know as well as I do that we are falling short on those objectives for too many students. Feel free to add anything else we should know about you. I’m a huge fan of Rotary. When I was first introduced to your organization through the Enterprise Academy you guys run, I came home to my parents and told them that it seemed like an organization I would like to join one day. 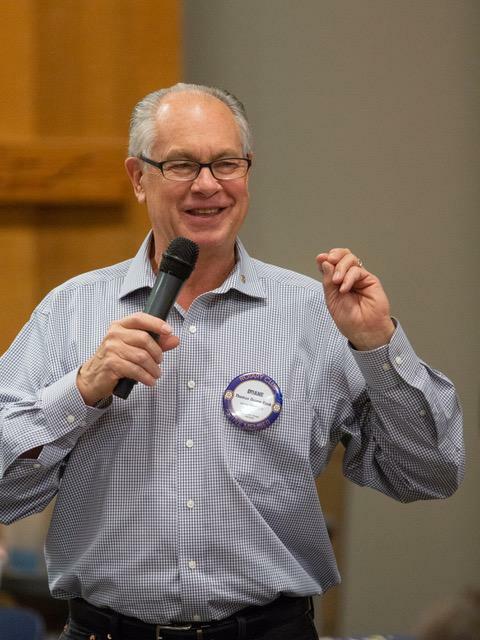 October Puzzler: Oct. 24 is World Polio Day for Rotary International. What worldwide leader was recently honored for his country's standout effort to raise funds for immunizations? How much have his country's Rotarians contributed? Eva is from southern Germany and introduced herself, her small town of Ostringen, celebrations, and said she was excited to be here. And grateful, too. One goal for her year she shared: to return to Germany being bilingual. Sharing a map of Italy, Jack pointed to his home city of Milan and spoke of its history architecture and being famous for fashion. He has found American people friendly--which Eva had also said. He's on the soccer team at Wilson. Sept. 11 in 2001 has become an important day in United States history. On that day, a handful of Muslim men hijacked U.S. commercial airliners with the purpose of causing maximum physical damage to urban communities and killing the travelers on the planes. Clearly, a primary goal of the Muslim men was to sow fear and disunity among the diverse American population. The hijackers came from a brand of Islam that denigrated other religious groups in the name of their religion. Harris also pointed disparagingly to cultural trends within the primarily white Christian population in America. He claimed that Americans are now demanding “sameness” whereas previously they believed in diversity. He also pointed to rising opposition to migration to the United States from other parts of the world. 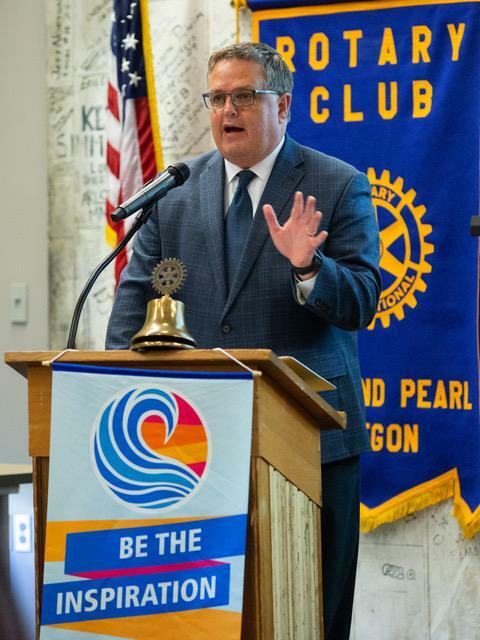 Max Williams, president of the Oregon Community Foundation (OCF), made a strong plea on Sept. 18 for Rotarians to help reverse state-wide negative trends in economic equality. 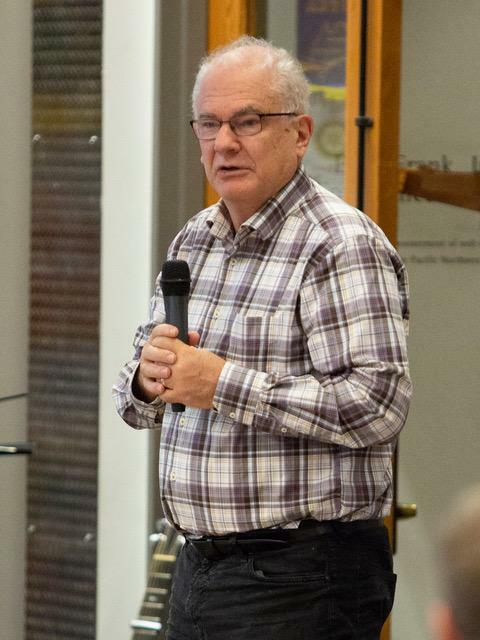 His plea drew from a more detailed statistical report that the foundation has prepared, “Toward a Thriving Future: Closing the Opportunity Gap for Oregon’s Kids.” The 41-page pdf report, filled with clear charts and data, is available on the internet here . 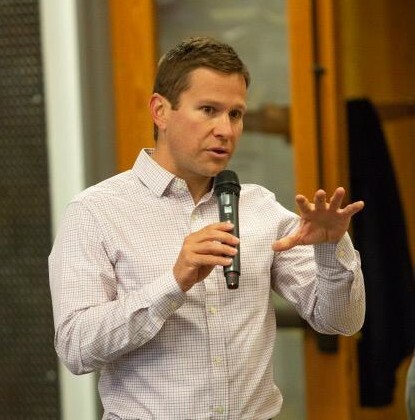 In his talk, Max summarized some of the dismal statistics about life in the state during the past few years: an increasing poverty rate, more than 100,000 families with low income, 40 percent of births to single parents, and 40 percent of new mothers supported primarily by federal Medicaid. The speaker envisioned the OCF as a key player in enhancing income and opportunity in Oregon. In its 45-year history, the OCF has seen its assets grow to $2.2 billion, mainly through individual, family and organization contributions. A prime goal has been creating awards and scholarships for deserving students. Max was quite clear in his talk that efforts to improve opportunity in Oregon must involve a much wider group of activists than just the OCF. He especially touted the need for “civic leadership." In addition, he emphasized that efforts must come from the private sector, beyond the usual activities of government. 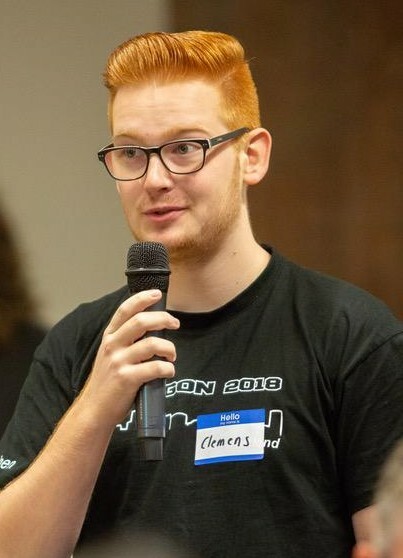 Speaking about the importance of “community,” Max urged various segments of the Oregon population to join in his proposed efforts. 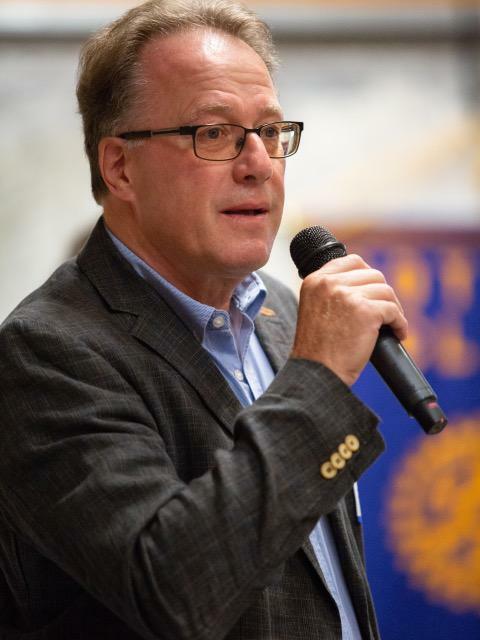 He emphasized the potentially important role of Rotary in furthering community goals, due to its philosophical commitment to such activities,its experience, and the ties of members with other community organizations. Max argued that efforts to create “community” will work best at the local level and need to be tailored to the specific problems of each locality. For instance, he argued that the problems of rural areas in Oregon are often different from those of urban areas. In 1977 Ned Look became president of OCF. 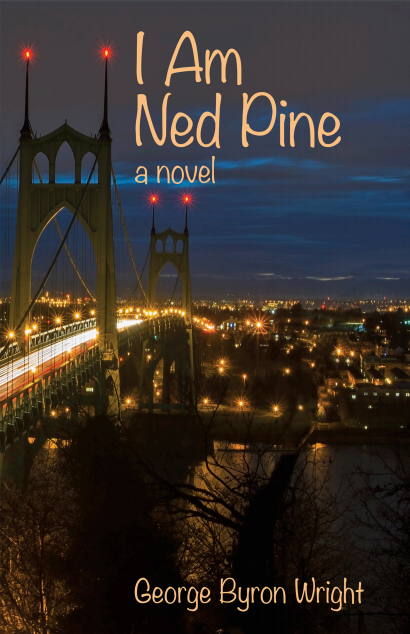 Ned was a good friend of the Portland Industrial Rotary Club. 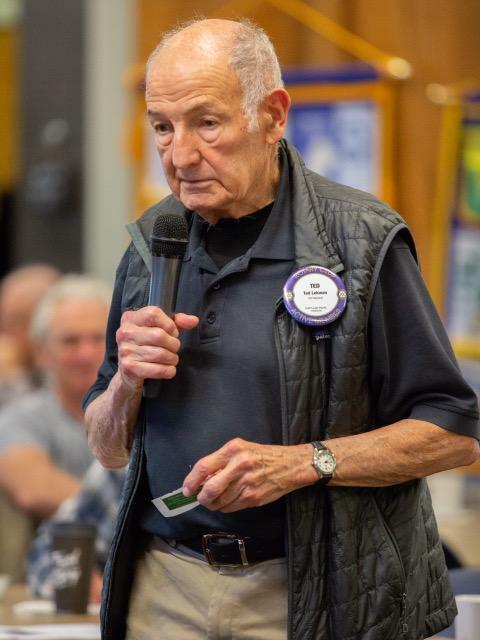 While he was a member of the downtown Rotary Club, he attended PIRC meetings more frequently than many of our own members. We must have been more fun to hang out with. OCF granted $75,000 to the Pearl Fund to help fund a long-term Youth Incentive project. This is by far the largest grant or donation in Pearl Fund history. The project was initiated by Phil Brown, our '94-95 president. The club selected bright middle school-age kids who were deemed at significant risk of dropping out of school. Our members mentored each of the kids regularly for six or seven years, through high school. 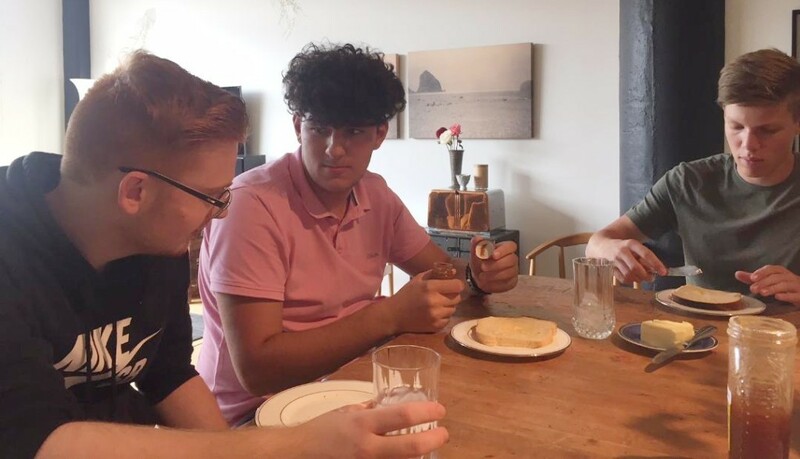 Those kids who completed the program and graduated from high school were granted a scholarship to pay for up to four years tuition at an Oregon public college or university. 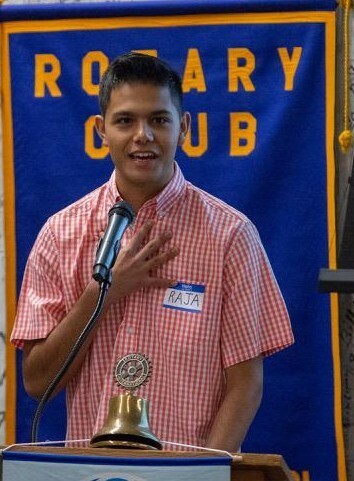 The program inspired several other Rotary Clubs in the district to start a Youth Incentive project. The program changed the trajectory of the life of each of the students we mentored. That is such a wonderful story to learn about! Thank you for sharing it. Phil Brown is still a friend of the foundation and a man I respect very much. I am also honored that I had the opportunity to meet Ned Look several times before his death. Thank you for all you and your club do to improve our community! Buzz Bowman is an active 88-year-old skier who has been working on the patrol at Mt. Hood since shortly after World War II ended. Most Oregonians would agree that the scenery around Mt. Hood is incredibly beautiful. Buzz likes it too, he told Pearl Rotarians Sept. 25. But in his Pearl talk he seemed especially enthralled with the many social ties he has made from his ski patrol work. Buzz told Rotarians that, even after all the years of skiing, he has very few enemies. He reported to the Pearl Club members that many changes have occurred in skiing since he started working the ski patrol. The equipment and ski lifts have improved greatly. Increasingly, skiers have cars that can get them to the resorts, rather than relying on a bus. Women are increasingly an important component of ski patrols. Ski patrollers have more experience than in the past and are better organized. Buzz looks like he has drunk a lot of Geritol, an elixir of old age, in his years on the ski patrol. Now, he probably does less skiing than in his earlier years, but he still enjoys the enthusiasm and physical prowess to continue. While taking a break from the ski patrol, Buzz serves as pharmacist and owner at Bowman’s Hillsdale Pharmacy. "Rotarian Sara Shah had a special interest in Buzz's visit to PPRC. Before the program, she bragged tearfully about her apprentice year when the physical requirements seemed so daunting that she was ready to quit. With Buzz’s calm encouragement, she was able to hang in and complete the training. She patrolled on Mt Hood for several years. Sara later switched to skinny skis and is an active member of the Mt. Rainer Nordic Patrol. After I introduced Buzz, the first thing he did was to give Sara a big hug. Priceless moment." Forty years ago, United Flight 173 approached PDX, prepared to complete what had been a routine passenger flight from Denver. A number of minutes later, the large DC-8 plane crash-landed in a residential area near E. Burnside and 157th. Of the 189 people on board, 10 died and 23 suffered injuries. Miraculously, none of the residents in the residential area was hurt by the crash. The plane was damaged by the crash impact. Fortunately, passenger plane crashes are infrequent, and the total death tolls from specific years rarely amount to the large numbers that die from vehicle accidents on highways. But, it turns out, the problems with Flight 173 have had large consequences on the nature of the U.S. passenger airline industry. To understand the social importance of the crash, Julie reported to Pearl members its major descriptive features. She then interpreted for the audience the major mechanical features of the crash. She concluded by describing how the events of the crash led eventually to major revisions in the U.S. airline industry. Why did the crash occur at the end of a routine flight from Denver? The initial problem, as Julie explained, was the possible failure of the plane wheels to descend from the DC-8 plane body as the approach to PDX occurred. However, the actual problems with the plane wheels could not be determined from the instruments. The crew then devoted a number of minutes to try to ascertain whether the wheels had actually failed to lower, and, if so, whether the problem could be corrected. Meanwhile, while working on the wheels, the plane crew failed to check adequately on the availability of plane fuel to maintain the flight pattern as the repairs occurred. Suddenly, the plane fuel ran out, sending the plane to a crash landing. So, what did investigations of the crash, including those by federal authorities, identify as the major underlying problems? Faulty equipment was undoubtedly related to the crash. But the authorities also focused on communication among the crew. The plane captain exerted little personal leadership over the crisis situation as the plane approached PDX. In turn, the crew showed little coordination in their efforts. In 1978, airline companies could resolve on their own any damage payments that were owed to the passengers on planes. There was no rule that required neutral parties to decide on damages. As a result of United’s power, the awarded damages to passengers varied widely, and a number of affected passengers received virtually nothing. Julie argued that two major changes occurred in the airline industry as a by-product of concerns about the crash. First, federal authorities developed specific rules and procedures to improve crew training, especially activities that involved multiple persons. Second, authorities established federal legal procedures to take away airline decisions on how much compensation would be awarded for the ill-effects of the crashes. Throughout the talk, Julie emphasized the human costs of the crash. Besides a number of people losing their lives, the survivors often experienced post-traumatic stress syndrome. Young children sometimes were traumatized by the events, she said. Humans have been looking thousands of years for the Fountain of Youth, powerful waters that enhance youthfulness and life expectancy. Ponce de Leon, a 16th Century Spaniard, was a well-known investigator of this idea. 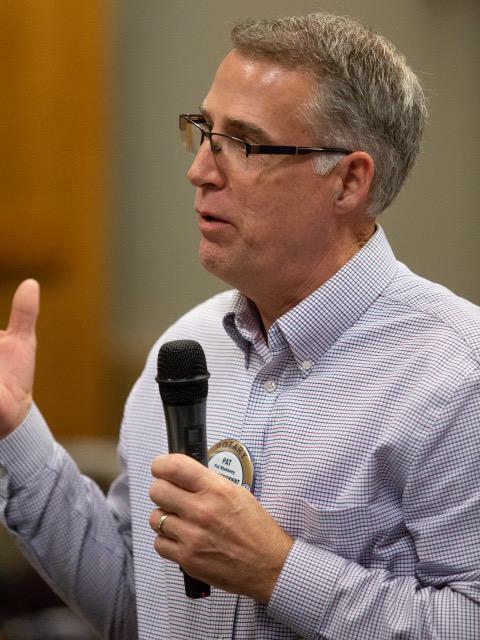 Mixed evidence exists on whether he found the Fountain near St. Augustine, Fla.
At the Pearl Rotary meeting Oct. 9, member Jerry Baysinger developed a new front in the struggle against living a short life. He talked about some of his efforts to use recent books and consultation about life expectancy to work out an educational program to focus on changing personal diet. Jerry’s program emphasizes changes in food consumption. He advocates the elimination of animal products (meat, fish, and dairy). He also avoids oils in his food, and he emphasizes fruits, vegetables, breads, grains and beans. Jerry says you can consume as much food as you want if you eat only veggies, yet never overeat or count calories. Jerry’s plan also has a couple of important caveats: If you smoke, stop. If you are sedentary, get moving. 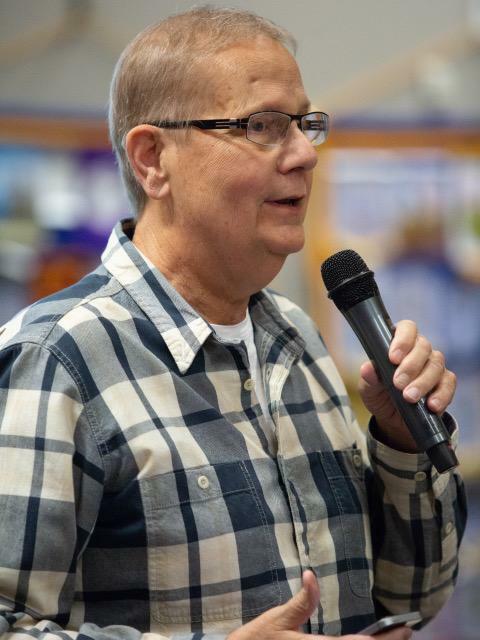 Jerry adopted his program after following the most common contemporary medical effort to ensure long life, taking a statin—a cholesterol-lowering drug that helps limit the clogging of arteries that regulate blood flow to our crucial master organ, the heart. He never got around to a more drastic solution, surgery to remove the blockages in his arteries, mainly because his diet efforts were working so well. The statins lowered his blood cholesterol and were supposed to stop the build-up of arterial plaques. They didn't. His arteries became increasingly more blocked. The talking Jerry was also a physical advertisement for his approach. A person in his senior years (he recently turned 70), he appeared strikingly slim, upright, and handsome at his talk, with the physical traits of a much younger person. Jerry’s goal is to die of “natural causes,” what he apparently means as the natural tendency of very old bodies to stop functioning well. 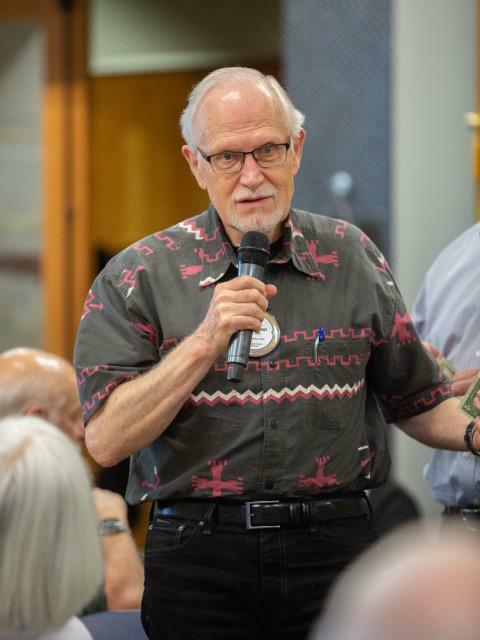 He told the Rotarians that “80 to 90 percent of us will die from what I have to say are ‘unnatural causes,' that is, diseases that are entirely preventable and mostly reversible. "Heart attacks, cancers and diabetes can be prevented and even reversed." T. Colin Campbell and Thomas M. Campbell, “The China Study”: The Most Comprehensive Study of Nutrition Ever Conducted.